In a study that we began in 2013, Digital Check discovered that poor-quality scanned images were costing banks up to $30 apiece to process when they came back rejected from the clearing process. These were typically difficult-to-scan checks or money orders with security printing, vivid backgrounds, faint printing or physical damage. The overall cost of dealing with these problem items could approach half a billion dollars annually in the U.S. alone. As a result of our efforts, we developed Clear By Digital Check, an image-enhancement tool for banks that can clean up specific areas of a check image with a click-and-drag interface. This is important because it allows the operator to clarify individual items that fail the image-quality test, rather than having the machine take its best guess and hope for a readable image. Our first customers began using Clear this summer. 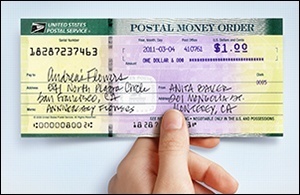 Many countries around the world use UV security features on their checks and other payment documents, and it only recently became possible to capture UV images of those items with a scanner. Machine-readable UV has opened up a whole new array of anti-fraud tactics, so long as the bank or customer has the proper device in place. Our TellerScan TS240-UV remains the best-selling UV scanner in the world – but in order to bring the benefits of UV within reach of more banks and businesses overseas, in May we introduced a UV-enabled version of our CheXpress CX30, the single-feed scanner that has been a best-seller both at home and abroad due to its reliability and affordable price. Look for more on UV in 2015 as the technology solidifies itself. We’ve been hearing from customers for years about the need for a check scanner that can accept other items besides just checks – invoices, ID cards, purchase orders, contracts, or just about anything else that can go along with a payment. The problem is that check scanners need to be able to read the MICR characters at the bottom of checks, which requires a special magnetic read head, as well as specialized motors to pull the document along at the precise pace necessary to pick up the magnetic signal. All of this adds cost – so much cost, in fact, that until recently, the only way to produce such a scanner was to make it so expensive that nobody would buy one. (This was not the first time we tried.) But, it finally became possible to get the price down enough for it to work, and so the SB650M was introduced in September. If you have a project that needs dual check and document scanning capability, contact us for details. Banks have felt ever-increasing pressure to crack down on money laundering and other suspicious transactions, and we developed Advisor by Digital CheckTM as a way to help cut down on certain kinds of risk with remote deposit. By being able to pinpoint the location of each in-use scanner to within as little as 100 yards, banks can tell, for example, whether a device has crossed a border or otherwise moved from the location they have on record. 2014 saw our first large-scale adoption of Advisor – which actually works with scanners from any manufacturer, not just our own. It was a big year north of the border, as Canada’s electronic check clearing system finally went from planning to reality. Digital Check was fortunate enough to gain a foothold as a supplier to four of the five largest Canadian banks, which are in varying stages of deploying remote deposit and related services. We also opened a Canadian website with the help of our distribution and service partners at Contact Innovation of Toronto. 2014 will likely go down in security circles as the “Year of the Data Breach,” with the aftermath of the Target breach kicking off the new year, and fresh incidents one after another at major nationwide operations including Home Depot, Albertson’s, P.F. Chang’s, and countless others. Credit cards are not our first line of business, but in March, we shipped the first units of the DockXpress, an encrypting magnetic stripe reader that plugs in to our CX30 and TS240 scanners. The most important feature of the DockXpress is that it applies hard-wired encryption directly at the magnetic read head, protecting data from software attacks such as the “RAM scraper” used in the Target hack. While it’s only designed to be used with our existing scanners, the DockXpress is a secure way of processing credit cards for anyone who needs a reader. We’d like to take this chance to thank all of our customers and partners for making this another great year at Digital Check. It’s been a pleasure working with you, and we look forward to serving you again in 2015!